As you will be aware the main roads to Haddington/Gifford will be closed on Sunday 1 July 2018, as will the Carfrae road, for the Ironman Scotland Cycle Race. Roads will be closed from 7.30am to 12.30pm. Access for emergency vehicles will be maintained at all times. If you have any concerns or issues with the roads being closed over this period please contact the race organisers on 03330 111838 or email them at edinburgh70.3@ironman.com. Please note that East Lothian Council has committed to host this race for three consecutive years (this is the 2nd year) but no consultation took place with the local community or community councils. If you are concerned with any aspect of this event please contact East Lothian Council. Villagers will be able to exit the village from the church end and can drive to Haddington via the Papple road. Also access to Stenton/Dunbar/East Linton etc. from the church end of Garvald will be unaffected. The Ironman Scotland event involves 70.3 miles of swimming, cycling and running. 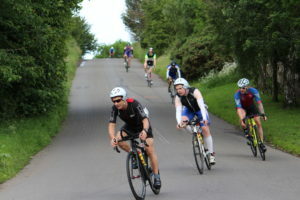 After the swim, the cycling section starts in Cockenzie, circles through seven villages returning to Dalkeith Country Park and onto Holyrood Park for the final stage of the race which is the half-marathon. The race organisers advise that the pro athletes are expected through our village at round 8.20am and then a steady flow of cyclists will follow until the road re-opens. If you’re up in time you’ll be able to catch sight of the intrepid racers as they pass through the top of the village but be careful – they will be travelling at speed! This entry was posted in Announcements on June 26, 2018 by Admin.